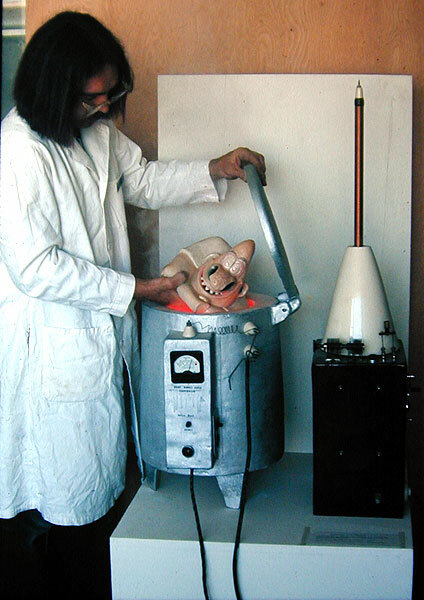 A demonstration of Internal Combustion Ceramics, using the apparatus pictured here was presented at the NCECA- Conference (National Council for Education in the Ceramic Arts) at Madison, Wisconsin, in 1974. "The bare hands of the artist are more sensitive to touch, and can feel what they are doing better without heavy asbestos gloves. The raku process is more exciting with bare hands too, and you don't have to go home and take a shower afterwards, because there's no smoke!" "Clayton Bailey was a participant in a seminar on alternative sources of fuel for the firing of ceramic kilns as a part of a national conference on ceramics held in Madison, WI, March 28-30, 1974. After a few sober potters told of their efforts to find other sources of fuel, Bailey came on stage and set up his kiln made of fabric, which was attached to a ceramic control box. On top of the control box were two long wires. Bailey explained that he had discovered a new method of firing pottery which might revolutionize ceramics. He had invented internal combustion ceramics. This involved, he said, mixing horse manure with clay. He brought out a bucket of fresh horse manure and spread it on the floor of the stage and proceeded to mix it by hand with clay. 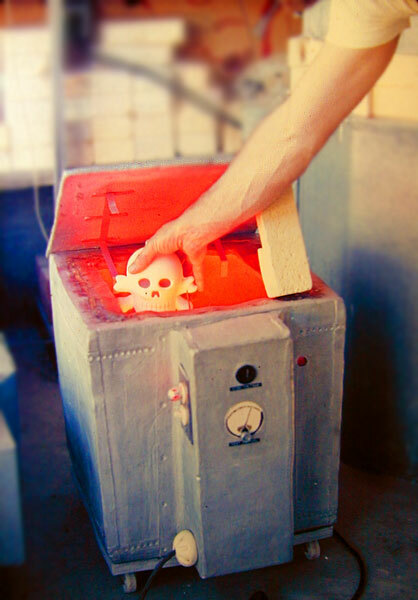 Then he placed a piece of this mixture in his kiln, noting that he was going to demonstrate bare-hands raku, meaning he intended to pull the piece out red-hot with his bare hands. Dressed in a white doctors coat, Bailey went over to his control box and began playing with his switches. He said that he would send several thousand watts of electricity into the kiln which would ignite the gas in the horse manure and this would fire his piece instantly. No other source of fuel or long hours of kiln-firing were necessary, he explained. The lights in the theater were turned down. Slow, rhythmic sparks began to climb the wires coming out of Bailey's control box, and strange noises were heard coming from the box. Suddenly, a rather loud explosion shook the audience and a terrible odor, along with hair, horse manure, etc..., came flying up out of the kiln on stage and into the audience. Bailey reached in and pulled out a partially translucent, red-glowing finished piece, and proudly showed it to the audience of cheering potters. 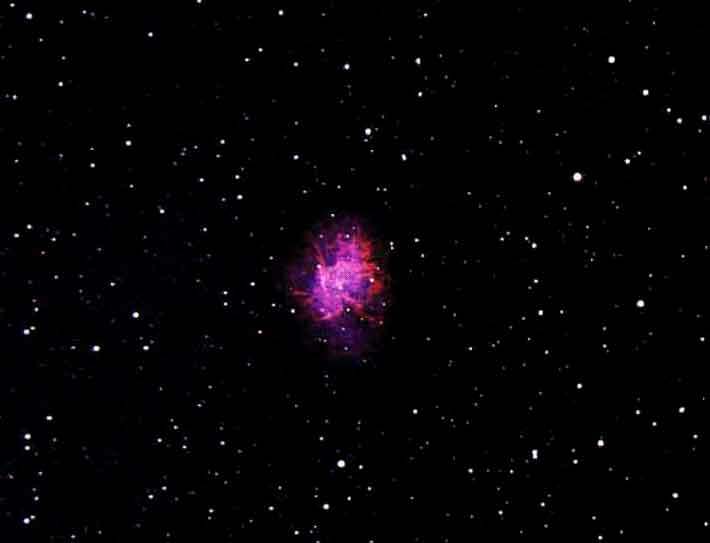 Bailey has become a performer and a magician - after long years of performing as a pot-maker and kiln-firer." After the lecture, the audience is invited to examine a copy of Bailey's book: "Bare Hands Raku: the book that shocked the ceramic world" When its metal cover is opened, a shock is delivered to the bare hands of the reader. The Bare Hands Raku apparatus in the Leslie Ceramics collection in Berkeley, features a Tesla coil for high-frequency ignition of the horse manure and has a built-in ozone air freshener. Bailey promises: "It provides all the fun of traditional raku, without the usual smells and discomforts, and it can be used in your living room." Infra Heat - A special, non hazardous low temperature heat effect produced by incandescent electric light bulbs "Infra Heat utilizes electromagnetic radiation from the visible spectrum instead of the more hazardous hyperthermic heat. The "Infra Heat" provides the cheery feeling of a fire or a "red-hot" kiln without the danger of burning your fingers or catching something on fire. Examples of the utilization of infra heat are: "Bare Hands Raku" and "Internal Combustion Ceramics".